In 1852, the country was so divided that neither the Democratic Party nor the Whig Party were able to settle upon a candidate. The Democratic convention took 49 ballots to nominate dark horse candidate Franklin Pierce. The Democrats were decisive compared to the Whig Party which needed 53 ballots to nominate General Winfield Scott. Slavery was the root cause. Party affiliation, Democrat or Whig, was less important than North versus South. Pierce had served in the New Hampshire legislature and U.S. Congress both as Representative and Senator. But he had been out of politics for ten years by 1852 and his anonymity helped make him a compromise candidate. He was mocked as a ‘dough face’, meaning a politician with pliable views. It was applied to Northerners sympathetic to the South. This enabled Pierce to win support in both regions of the country. During the 1852 campaign Pierce’s opponents ridiculed his reputation for drinking and lackluster service in the Mexican-American war by calling him ‘hero of many a well-fought bottle’. As the Whig party was in the process of collapsing, Pierce became President in a landslide victory. Even in foreign affairs slavery was the main focus of Pierce’s presidency. He attempted to purchase Cuba from Spain to add another slave state to the Union. Pierce’s staff wrote a controversial document called the ‘Ostend Manifesto’ which justified taking Cuba by force if Spain refused to sell the colony. Northern opposition halted that effort. Cuba itself did not abolish slavery until 1886. A private army recruited in America by military adventurer William Walker conquered part of Nicaragua in 1855 and was recognized as the official government by President Pierce. Walker appealed for Southern support by reinstating slavery which Nicaragua had eliminated in 1821. A coalition of Latin American countries defeated Walker and he was eventually executed by firing squad in Honduras in 1860. The Compromise of 1850 was possibly the last chance of keeping the Union together. In that Compromise, California was admitted as a free state, while the Utah and New Mexico territories, obtained in the Mexican-American War, would be allowed to decide for themselves about slavery. The Compromise also included a stronger Fugitive Slave Law, very unpopular in the North. By the 1850s, both farmers and the railroads were interested in developing the remainder of the Louisiana Purchase: the Nebraska and Kansas Territories. To facilitate these developments, the lands needed to be organized and territorial governments established. Southern legislators wanted to overturn the 1820 Missouri Compromise, which banned slavery in the Louisiana purchase north of Missouri’s southern border. 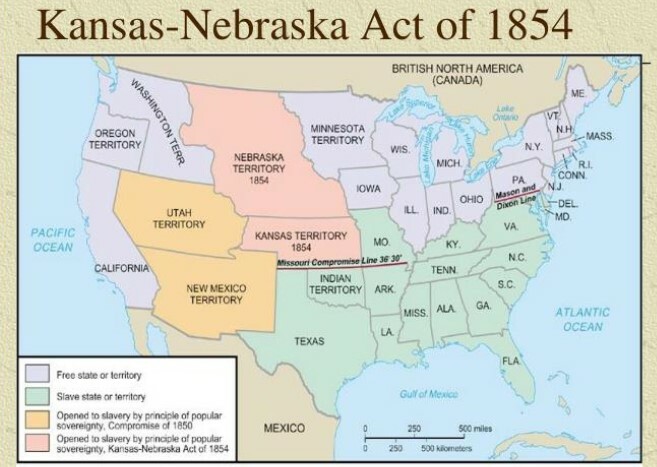 This would allow slavery in the Kansas/Nebraska territories. There was also debate over the route the transcontinental railroad should take – a central route or a Southern route. The Southern route was too mountainous given the Mexican border that existed at the time. Pierce had Ambassador Gadsden negotiate a purchase from Mexico of additional land area more amenable to a railroad. This Gadsden Purchase was over 15 times more expensive per acre than the Louisiana Purchase. Stephen Douglas, Senator from Illinois, wanted a central route for the Transcontinental Railroad coming out of Chicago. The Southerners offered to support the central route for the railroad if, in return, the bill allowed the people living in the west to decide on slavery (‘popular sovereignty’). Pierce helped to line up votes using his patronage powers. The debate was intense. Anti-Slavery Northerners were incensed at the repeal of the Missouri Compromise line and the possibility of slavery expansion. The Kansas-Nebraska Act narrowly passed in the house: 113 to 100. Northern Democrats had supported the Bill 44 to 42, while all 45 Northern Whigs opposed it. There is no doubt that had Pierce announced opposition to the Bill, it would have failed. Passage of the Bill was the beginning of the end of the Union. The Whig Party completed its collapse, with the anti-slavery Republican Party taking its place. Anger between North and South grew, as exemplified by the caning of Charles Sumner. Senator Sumner from Massachusetts was an abolitionist. After Sumner made a fiery speech criticizing slaveholders, Representative Brooks of South Carolina beat Sumner nearly to death with his cane on the Senate floor. Pro and Anti-slavery forces rushed into Kansas resulting in violent confrontations in what became known as ‘Bleeding Kansas’. The spectacle reinforced the divide between the North and South. Pierce generally supported the pro-slavery forces during the remainder of his term. You might say the slavery did not play in Peoria. Pierce was denied re-nomination by the Democrats in 1856. The party had been demolished in the 1854 mid-terms by Northerners discontented with the Kansas-Nebraska Act. In 1860, as the Democratic Party split, Pierce was approached about being a compromise candidate, but he demurred. Perhaps he deserves a bit of sympathy. His last remaining child died tragically in a train accident while riding with his parents enroute to the 1853 inauguration. Pierce and his wife personally saw their 11 year old son crushed and nearly decapitated. Pierce’s wife never recovered and died during the Civil War. Pierce lived out the rest of his life quietly in New Hampshire until his death in 1869.